Rob said today the League introduced the new uniforms for this season. So they had a few of them model for the cameras. 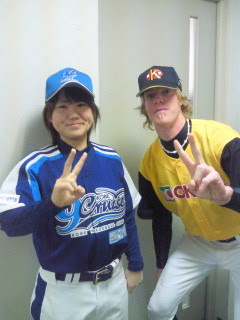 The girl in the blue is the first female to play in the Professional Japanese League, so Rob took a picture with her. 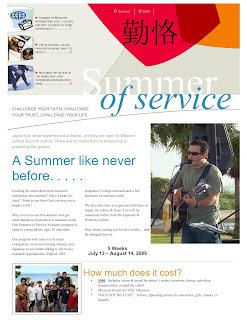 The group picture above was featured on the home page of http://www.yahoo.co.jp/ . That is pretty big time! 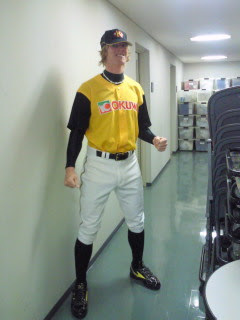 Well, just a few more days before opening day here in Japan, and Rob is a starting pitcher. Please continue to keep him in your prayers. 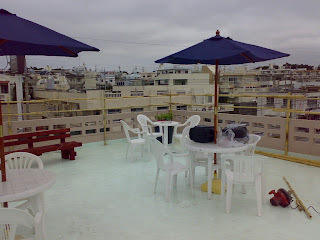 The Patio upstairs on the Roof of the Koinonia Cafe is coming together smoothly. We decided to go with Bamboo rather than metal piping. It creates a more relaxed atmosphere and looks great. The wonders of bamboo are amazing. For a couple of reasons, it is durable, extremely strong, and mildew/mold resistant. 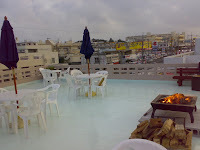 The Patio roof area is a real blessing. The Lord has blessed the Bible College Students through the hands of Ira. Almost weekly we have new/reconditioned bicycles for them to use. They are located about 15 to 20 minutes away from the school, and these bikes cut their time in half. Next thing you know we are going to look like Tokyo Station, just kidding. Thank you Ira for your hard work in blessing all the students. The ladies got together for a Purity Seminar at CCGinowan. They had a great turnout! All of the ladies were so blessed. For lunch they had a sit down meal at the Koinonia Cafe. The guys did all the serving and clean up. The ladies do so much serving. It was a blessing to see them served for the afternoon. We did not get any ministry pictures since it was "no boys allowed", but the Lord truly spoke the whole morning and afternoon in a special way. We can hardly believe that 1/4 of the Bible College Semester is already finished. Time is just blowing by so fast. We really do want it to slow down so we can enjoy the students longer. God has given us some great weeks of study. Since this Friday marked the special occasion, we headed out to Tropical Beach for some time with Jesus and each other. It was a great time. If you look closely, you can see one of our Bible College Students, crashed out on the beach. Do you know who it is? Andrew blessed us all, as we celebrated his 3 year visa renewal. He bought icecream for everyone. We all were so blessed. It really is a celebration in that most people only get a 1 year renewal and he is allowed to continue ministering for another 3 years. Praise the Lord! Cathy and Brent Mize have a New Baby! In Cathy's own words; "Ashton was born February 10th. 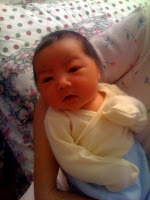 He was 8lbs 7oz, and 18 1/2 long. Brent and I are super blessed to have such a healthy, happy baby. 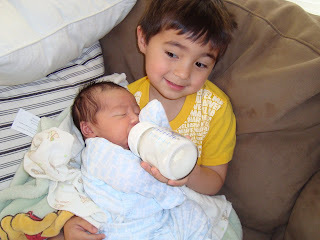 Aaron is having fun being the big brother.." Praise the Lord! We are so blessed for you Mize family, may the Lord continue to bless your whole family. Neely just received his renewal visa; 3 years Missionary Visa status. That is so incredible! 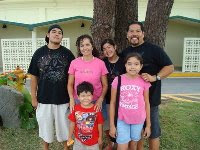 We are so blessed that the Lord is allowing Andrew to continue to serve the Lord out here in Okinawa Japan. God is so good. Please send Neely as Visa greeting below. If you really think, it is incredible as we are able through the internet to stay so connected to other missionaries in other countries. Daniel and Sosimo are doing great in Korea. As you can see the weather is quite cold there. God continues to open doors for these brothers and they are serving the Lord full time. God bless you boys, be blessed in Jesus. Hello everyone! 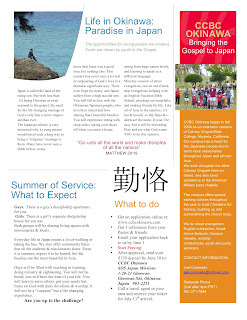 We want to invite you to become a part of our Summer Missions Outreach here in Okinawa Japan. This Summer is an extension of the Bible College and we anticipate a wonder time as we seek the Lord, have fun in the Son, and outreach to the people of Okinawa. Hopefully you can be a part. Double click on the pictures to get a better reading view. Please pray and email us at tommyruizjr@hotmail.com if you have any questions. God bless you! 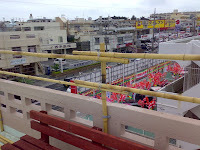 Yuka Saido went back home to Mainland Japan. She left her car with us to use for the Lord's Work. We were so blessed. It is a yellow plate car which means it has a smaller engine thus uses less gas and less road tax. Praise the Lord! God is so good! This is absolutely beautiful! What a wonderful couple! It looks like something right out of a storybook. Congratulations again Tom and Jiai. For the rest of us, please click on the photo above to get a better look at the Newsletter. This is a video that Joel and Eder put together. They made it tracing the history of Calvary Chapel Ginowan. From the first days holding church in the Ruiz House living room, to our blessed present location. We hope you like it. You are going to see some familiar faces, old and new. Please click on the video above. Also, if you get a chance, can you put a comment up on one of your fond memories of CCGinowan. It's Official! Yes! You heard it first here on e3missions! 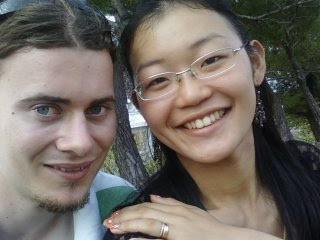 Tom and Jiai are engaged! You heard right, Tom proposed to Jiai Saturday night, but he had to wait until Jiai's dad said it was ok. Well, he got the official news later that night. So after the church dedication they made the announcement in front of the Church. Everyone was so surprised! Especially Pastor Tim, he was speechless. He thought that they were going to make an official announcement that they were dating (but everyone knew that). Please leave an engagement greeting for them below. 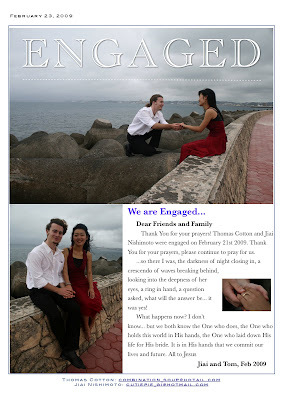 Congratulations Tom and Jiai, we are so happy for you and we love you. The top floor of the Church is coming together. 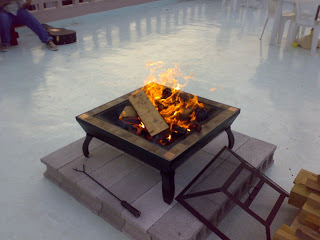 We decided to break out the fire place so that people can hang out there before the Church dedication. I do not have any pictures of what it looked like at night but it was beautiful. The fire was blazin, the scenery was beautiful. Total relaxing, is was awesome. Praise the Lord the roof area is coming together beautifully. 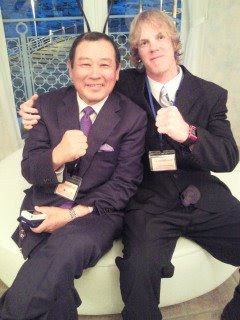 From the words of Robert Wunderlich : "This is our coach Taira Fujita, he is very famous in Japan. Keisho will know him for sure. 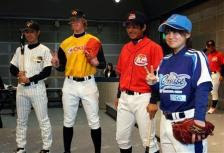 He played for the Hanshin Tigers for 19 years and coached them in 95-96." Rob is honored to be coached by such a well known player. He also just got word the other day; he will be the starting pitcher for opening day. There are 6 other pitchers on the team, but he got the call. Rob feels that God has opened this door for him. He would rather come in as a relief pitcher, but God knows what He is doing. Please continue to pray for our brother that the Lord would use him in a great way. 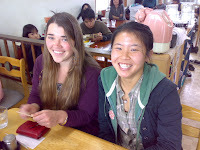 After Church Sunday we took some of the Bible College Students out for lunch at a local Okinawan Restaurant. This place serves some large portions! 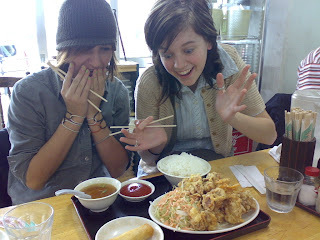 The girls were suprized at the size but also happy there was so much food. Mmmmm Yummy! This is the video of the interview after the announcement at Church. Everyone was so blessed for them. Please click on the video above. Tonight we dedicated the church building at w2. We were so blessed! Pastor Masaru and Pastor Rick from CCNaha and CCOkinawa were the guest speakers. Both of the Pastor's did an excellent job teaching the Word of God. It was a blessed night! Praise the Lord! 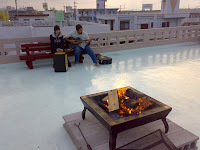 We had a blessed time sharing the Gospel at Mihama Saturday night. Different people led in worship as we passed out tracts and shared the love of Jesus Christ. If you are in the Mihama area on Saturday nights, come out and help us share the Love of Jesus Christ with the people who are gathered there at night. 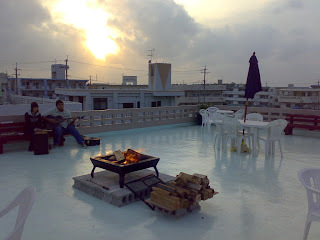 Okinawa is kind of cool in that most buildings have small water towers on the roofs. We have small pumps that send the water to holding tanks and then let gravity take its course. Also, during dry spells the water is turned off and everyone has to ration their usage. Well, Amber, Amanda and Takemori went to work on their design. It has Japanese and english Scriptures written and also Amber wanted to keep the Okinawan feel to it in that she make the scene look a little "Typhoonish" with the clouds and the waves. Great work gang, thank you for blessing all of us.